New Delhi, 27 August 2017: The deadline to file first Goods and Service Tax (GST) return for the month of July ended on 25th August. As per the report by the government official, over 29 lakh businesses have filed the GSTR Form 3B before the deadline. GST-Network, the company managing the tax filing apparatus, had geared up the IT network to handle the last minute rush to avoid a repeat of last week when GSTN portal had crashed. After the crash, the Ministry of Finance had extended the deadline till August 28. What needs to be noted here is, this extension of deadline to August 28, is only for those taxpayers who wants to use the opening balance of pre-GST in the current month. However, for those taxpayers who do not have any credit, the deadline was August 25th. About 48 lakh taxpayers had saved the sales data on the portal till August 23 and they are just a step away from paying taxes and filing returns. An estimated Rs 50,000 crore had come in from taxes from those returns, as reported by IANS. Now, the question is, what if you have missed this deadline? Form GSTR-3B was needed to be filed by a taxable person under GST for submitting the provisional assessment of the tax liability. Each manufacturer, trader, service provider who is liable to register under GST has to complete a self-assessment of his taxes and has to file form GSTR-3B. The mandatory form was needed to be submitted even if a business has done "zero" transaction during July. Which means, the business will have to file nil return. After the deadline, the taxpayer will be liable to pay interest of 18% per annum and a late fee. Interest and late fee will be calculated by the tax payer on the amount of outstanding tax to be paid. Time period will be from the next day of filing to the date of payment. Late fee is Rs 100 per day and maximum is Rs 5,000 which will be calculated by the GST Portal. Hence, starting from today, the taxpayers who could not file GSTR last night, will have to pay interest till the form has been submitted. GST-3B includes a full detail of the tax under different heads CGST, SGST, UTGST, IGST and cess for the transactions which were taxable due to reverse charge. 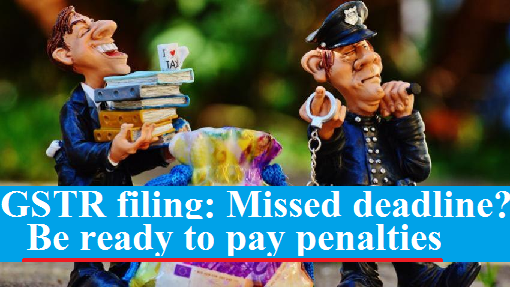 After the deadline, the taxpayer will be liable to pay interest of 18% per annum and a late fee. Interest and late fee will be calculated by the tax payer on the amount of outstanding tax to be paid.